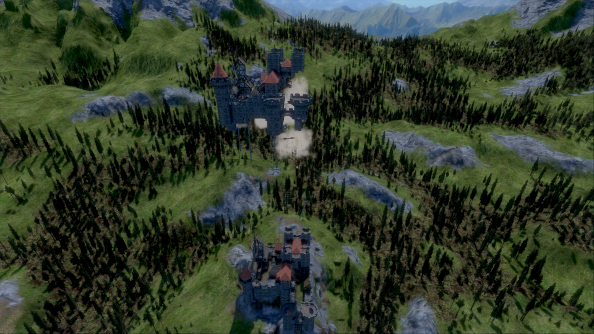 I know what you’re thinking: it’s Space Engineers with castles. 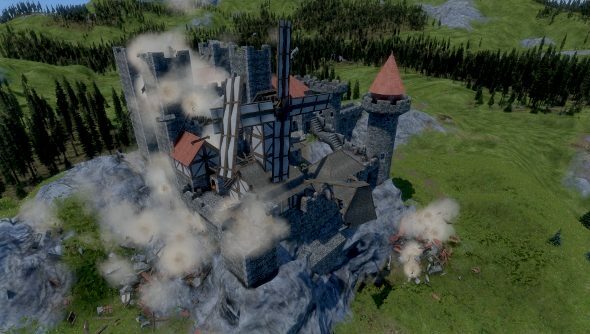 Medieval Engineers is the second Early Access game from Keen Software, and like its predecessor, it’s a building game and physics simulation. The similarities run deep, but two key differences set the games apart. 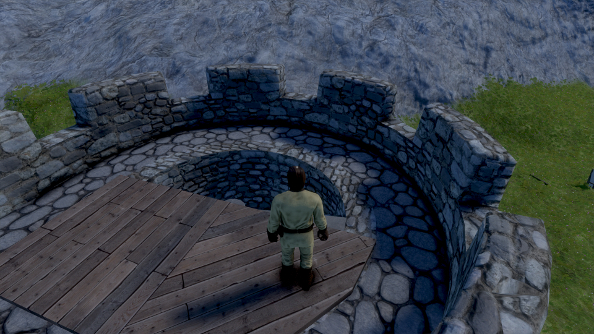 Where Space Engineers was a game free from gravity, Medieval Engineers is shackled by it. Things don’t fly, they fall, and this informs how and what you can build. Then there’s the second key difference: castles just aren’t as much fun as spaceships. A bold statement, you might say if you’re a fan of big stalwart walls and mighty towers. Castles are cool. Giant, towering monuments to ego and dominance. Who wouldn’t want a castle? But you can’t do much with an empty one. Spaceships you can fly; you can shoot off into space, weaving between asteroids, launching a barrage of missiles and laser blasts into enemy vessels, smashing into them in a last ditch effort to win a dogfight. A castle just sits there, looking tough. 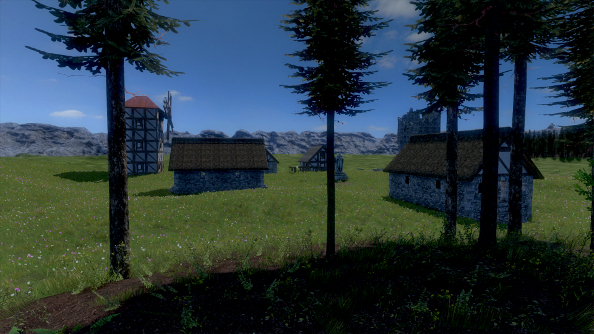 Right now, Medieval Engineers is an impressive prototype, more a tech demo than a game. You build something, and then you’re done. You either build something else, or you destroy what you’ve just built. Most of the game is spent in between planning and destroying, erecting the giant castles and the occasional mechanical contraption. A surprisingly plain –but also infinite, at the moment –inventory of objects and blocks can form some impressive looking structures. They’re all mostly grey and gloomy, but can be elaborate, indomitable fortifications. Houses and windmills can also be put together, if you want to expand your castle into a walled town or put together a wee village. The promise of being able to pluck a medieval settlement or fortress out of my imagination and give it form is a seductive one, and I can’t deny a sense of satisfaction when I constructed my first windmill and watched the blades gently spin, or when I put the last block into the first tower of my imposing castle. But while I was excited to make progress, and even more excited to see the finished result, I can’t honestly say that I had much fun building anything. I spent half an hour trying to build a simple fence. It started off fine, but then the terrain sloped downward, almost imperceptibly, and the hungry ground began swallowing my little wooden fence pieces. Instead of following the contour of the terrain, they followed a flat grid. Unshackling the object from the grid meant that I couldn’t connect it to the other fence pieces. And altering the terrain just isn’t an option. Okay, it is an option, but it’s not a realistic one. Terraforming is just horrible and creates more problems than it solves. In an attempt to level out some terrain for a Tower of London inspired prison, I ended up making an elaborate cave network under my feet. And then the half-finished castle collapsed, the ground unable to support its weight. 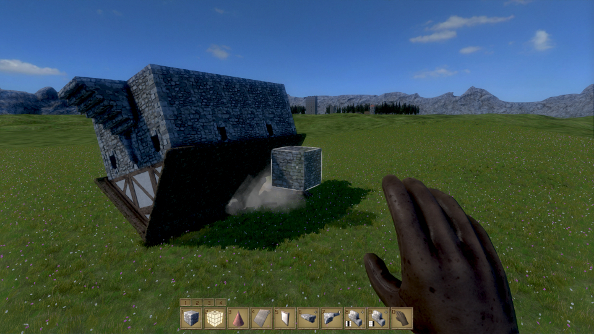 Just as Space Engineers’ lack of gravity posed a construction challenge, Medieval Engineers’ abundance of it poses a challenge too. Structural integrity can be turned on and off whenever a new custom world is created, and if it’s on, that means that towers can tumble. If you just build up and up, without anything supporting the tower beyond the ground itself, then the weight of the blocks will eventually bring it crashing on top of you. I’ve seen people recommend that new players turn it off, but that just sounds like terrible advice. At the moment, it’s the most interesting facet of construction. It elevates plonking blocks down into a puzzle, and while I wouldn’t go so far as to say that it makes building fun, it at least makes it engaging. Construction’s also easy, in stark contrast to dealing with terrain and using the terraforming tools. Entire buildings can be copied and pasted, or even turned into a blueprint that can be used at any time, meaning that you can create a whole village by just making a couple of buildings and then copying them. These blueprints can be rotated and even turned on their head, the latter of which I’ve yet to find a use for. But best of all, they can be summoned out of thin air and dropped on other buildings. 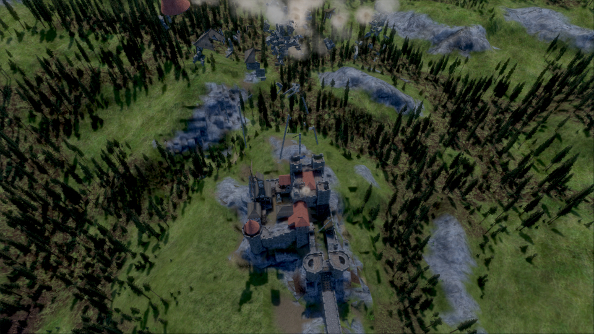 Throughout that castle collision, my frame rate was at 1 per second. 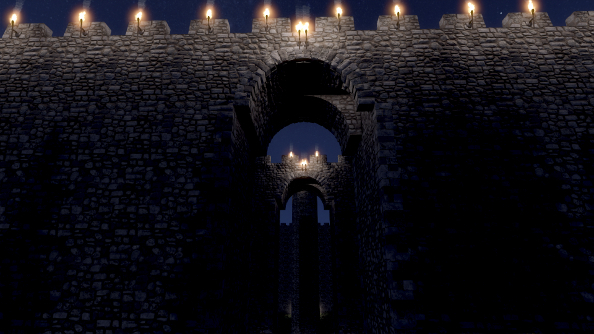 Conceptually, Medieval Engineers is infinitely more exciting than what currently exists. There is undoubtedly potential here, and it’s slowly revealing itself. February’s Barbarian update offered up a taste of the game’s future, with simple, AI controlled blokes running around the map looking for statues to smash. These barbarians are a bit rubbish, as invaders go, but they do make for great trap experiment subjects. From a very basic list of items, some surprisingly elaborate traps can be created. It’s all very MacGyver, with some bits of wood and a piece of rope being all you need to craft clever obstacles. If you prefer offense over defense, you could always slap together some bits and bobs and build a catapult. They’re on the trickier end of the engineering scale, but making a functional catapult is something every Medieval engineer should know. But again we get back to the purposelessness that permeates throughout this Early Access. You’ve build a catapult — what do you do with it? 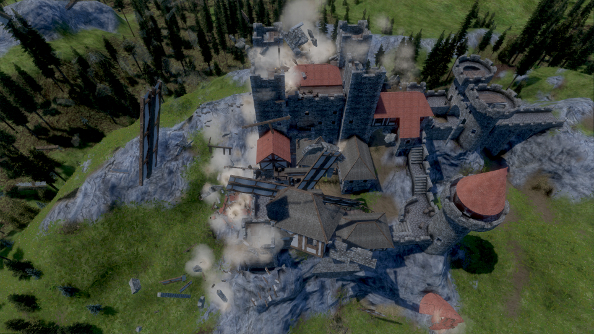 There’s only one real purpose for it at the moment: destroying your own castle. And suddenly, you’re the barbarian, smashing down the walls. For shame. 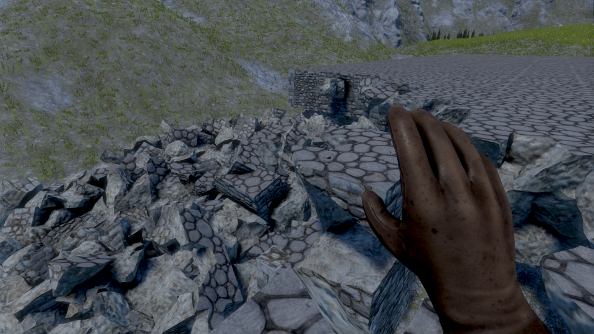 Multiplayer, that’s what Medieval Engineers needs to start feeling like a game instead of a prototype. Players attempting to smash down each other’s castles, colliding armies, rows of catapults demolishing everything in front of them — it’s surely the end goal. But that might be a long way off, in a future where the game doesn’t flip out when there are too many fractured chunks (you can limit the number when you start a new world, thankfully) of buildings to simulate. In the mean time, it’s just a bit too hollow, like all of these empty castles.